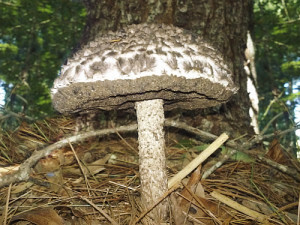 As mentioned in one of my previous posts I’ve decided that I will only learn what mushrooms and fungus are “edible” and not confuse my mind trying to memorize the ones that are poisonous or toxic. 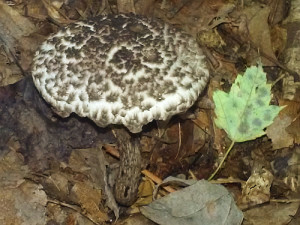 In doing so I depend on the distinctives of each edible, and “old man in the woods” mushrooms have unique characteristics that make them easy to identify. Their appearance can be described as having a white underlying color with a scaley reticulated dark gray to black surface on both cap and stalk. No one seems to know where that name came from but I would guess that they look similar to old men in the woods who might have wrinkled skin that have been parched by the sun and the elements. They belong to the bolete family of mushrooms and thus have a spongy bottom side of the cap that starts light when young but becomes darker to black with age. The flesh is white but when bruised or exposed turns darker in color, sometimes reddish to dark gray. It has a very mild taste and turns very dark to black when cooked. Admittedly, everything tastes better with butter but I used olive oil to fry these. I look forward to my next find of this very interesting mushroom.